As I was reading stacks of pumpkin books, I realized something. 1. Life cycle of the pumpkin--endlessly fascinating, apparently, because SO many books do this! 2. Pumpkins growing out of control. Not sure why on this one, but there are several with this theme. Whichever is your favorite, I hope you and your kiddos enjoy these (gasp--unlucky!) 13 picture books! A little girl goes with her family to Mr. Comstock's orchard and pumpkin patch, where they pick apples and find the best pumpkin of them all. A good one for younger children or beginning readers. Short, simple sentences described the family outing. Many 2-page spreads were just 1 sentence on the first page, then a full illustration on the second page. A good introduction to the season for the littles! What would happen if you grew some giant pumpkin seeds? Would your pumpkin block traffic on the interstate? Would it be too big to hide behind the capital dome? A tour of the United States, with all differently-carved giant pumpkins for tour guides. 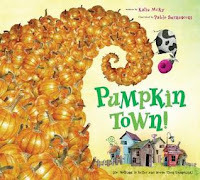 This would be another good choice for younger kiddos, as the text was very short--1-2 sentences per page--and every page had a pumpkin peeking out in silly places to keep things lively. Mr. Tiffin's class has another challenge. This time they are trying to figure out how many seeds are inside each of 3 pumpkins: small, medium, and large. They also have to decide how to count the seeds. One group decides to count by 2's, one group counts by 5's, and Charlie counts by 10's. Charlie is the smallest boy in the class and he gets to count the smallest pumpkin's seeds all by himself. At the end of all the counting, there's a surprise for Charlie! I learned something about pumpkins from this book! I never realized that they form seeds along the lines on the outside--hence a smaller pumpkin with more lines will have more seeds. Of course we had to count the seeds with each group. Nice way to sneak a little math in there! "The pumpkin seed makes the pumpkin plant, and the pumpkin plant makes pumpkins." 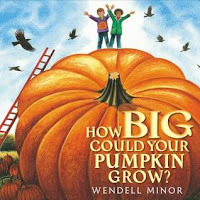 Bright full-color photographs, including some neat close-up shots, complemented the rhyming text; all about the pumpkin life cycle from seeds to plants to pumpkins. Who would have guessed this one pumpkin could be the beginnings of an orange avalanche of pumpkins? Rich text, including phrases like "whirly, swirly" and "unruly roly-polies." The mayor's speech adds some great vocabulary words (all starting with the letter 'p')--spelled out by syllable in the text, such as: "pre-pos-ter-ous," and "pleth-o-ra." Illustrations done in acrylics, with whimsical insects and animals adding to the fun. 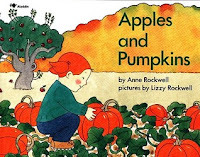 The last page had instructions for growing a giant pumpkin, and a recipe for roasted pumpkin seeds. 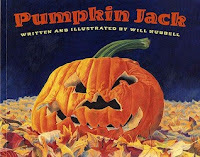 The story of Tim's carved pumpkin, named Jack. After Halloween, he throws him out into the garden. Jack starts to look different. He gets moldy and flattens out. By spring not much is left, so Tim throws some dirt over Jack. Then a new sprout appears! The cycle begins again. 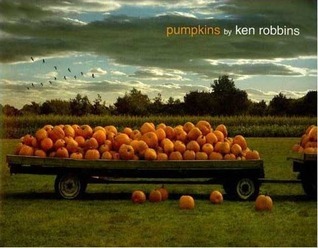 There seems to be a whole sub-genre for the pumpkin life cycle! This one stood out for its realistic-looking illustrations. I also really liked the descriptive writing. Little phrases, like when Tim carried Jack to the garden, "which was filled with the brown ghosts of last summer's plants," and the next fall after a frost: "The frozen plants seemed changed to pale blue glass." 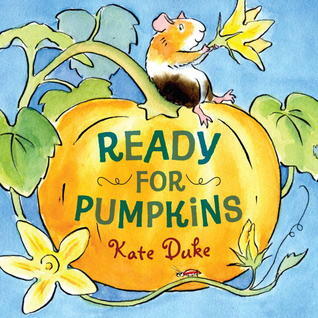 Jamie plants a pumpkin seed and watches it grow until it is time to make it into a jack-o-lantern! 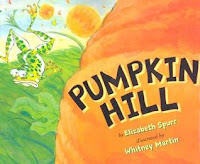 Yes, another pumpkin life cycle book! The simplicity and short text of this one make it just perfect for younger kids. 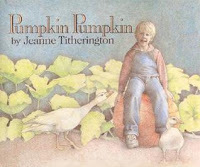 I loved the illustrations, each showing Jamie in the pumpkin patch, always with a little animal of some kind. This was one of my go-to books for fall storytimes, back in the day, and I just used it for Joy School (home preschool) last week. Duck, Squirrel, and Cat live together in the woods, in a little white (gourd-shaped) house. They make music together and every night they eat pumpkin soup. 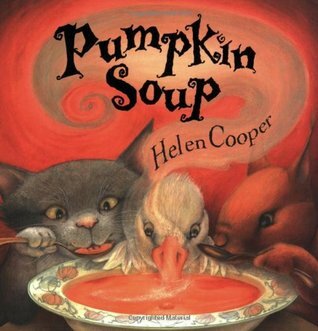 Cat cuts up the pumpkin, squirrel stirs in the water and Duck adds just enough salt. Everything is great. Until one day, Duck decides to stir. Boy does he ever! He stirs up a big fight among the three friends, which ends with him leaving in a huff. Will these 3 friends ever settle their differences? This was such a great little story--one that anyone with siblings (or children) would be able to relate to. All was well, until one person decided to rock the boat. Then---watch out! The illustrations were enjoyable, as well. I don't know that I've ever had pumpkin soup, but this book made it sound delicious--and that little white house looked so cozy! Jose and his family grow pumpkins. One fall day they throw out the extra seeds at the edge of the field. The wind picks up those seeds and sprinkles them down over the town below. That seems to be the end of it. Until next spring, when those vines (and pumpkins) start to grow and grow and grow! When the brothers realize what's going on, they decide they'll have to do something about it! I especially liked how the brothers decided to help out the townspeople--they took responsibility, even though they could easily have looked the other way. They were humble, too! When their Pa asked them what they had been up to, they simply replied, "We just helped the townspeople with their harvest." The ending made it easy to continue telling the story. 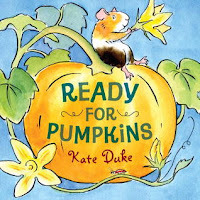 In fact, when my oldest read it, he actually went back through later and wrote the sequel, putting in watermelons for pumpkins. The illustrations were interesting, too. They looked like a mix of photographs (all the hair), painting, and possibly cut paper. Beautiful full-page photographs and simple text illustrate the pumpkin's life cycle. 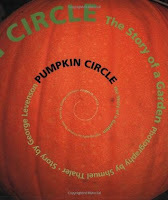 Another one of these pumpkin life cycle books! I loved that photo on the cover; I would frame it and hang it in my house. The other photos showed the farmer (a woman this time-yay!) planting her pumpkin seeds, then the closeup shots as the plants grew and produced the pumpkins. Like many of the others, it ended with carving Jack-o-lanterns on Halloween. Hercules ("Just call me Herky!") is the pet guinea pig in Miss MacGuffey's 1st-grade classroom. He has a good life. One day, during a classroom Jack-o-lantern project, some pumpkin seeds stick to his fur. He carefully saves them. Later on, when Miss MacGuffey takes him to spend the summer on her dad's farm, he plants the seeds. A rabbit named Daisy helps him. Together they wait for those seeds to grow and nurture the little seedlings. Poor Herky has to return to the classroom before picking any pumpkins. That's not quite the end of the story, though! There's a surprise delivery in October. Herky told his story in first person. The illustrations were a combination of regular picture book and comic-book style, with speech bubbles for the characters. Here's my favorite quote: "A garden is not a place to be angry in." That's right. When Buck, Billy, and little Lil Baxter head up the hill, what do they find? An enormous pumpkin! The brothers cut it loose and it goes bounding down the hill to the Baxter farm, smashing through gates and stys, until Papa Baxter uses his head and plows a pumpkin bed. Then of course, it's time for Granny to get busy making all sorts of delicious pumpkin food! This rollicking book was just plain fun to read. 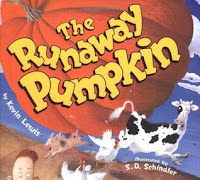 Every other page or so there's a catchy refrain about the "thumpin', bumpin', round and roly, runaway pumpkin!" Schindler's illustrations added humorous details to the already lively story. Grandpa's costume on the last page is my absolute favorite! Rebecca Estelle has hated pumpkins, ever since she was a girl, and poverty-stricken family had only pumpkin to eat for an entire month. 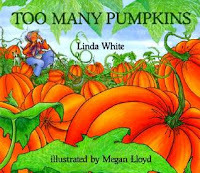 One fall day, an enormous pumpkin falls off the pumpkin truck and smashes all over her yard. She refuses to touch it or even look at it, and immediately buries it. The next spring pumpkin vines sprout up, and despite Rebecca Estelle's best efforts those pumpkins keep coming back. Finally she decides to just ignore them completely, certain that they will wither away and die from neglect. However, when she goes out to rake leaves one fall day, she finds her entire front yard covered in pumpkins! Oh dear. Now what is she going to do? I'm sensing another theme here! Apparently, it is very easy to grow a whole lotta pumpkins! Engaging illustrations and a straightforward story. My kids knew right away that just ignoring those pumpkins was going to be trouble, so that made them even more interested in the outcome. A warm ending made it all worth it. 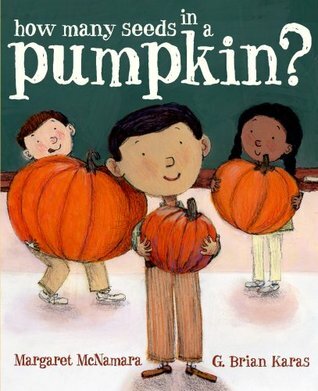 What are some of your favorite pumpkin books? Any must-reads for me?